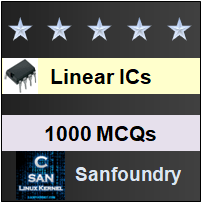 This set of Linear Integrated Circuit Multiple Choice Questions & Answers (MCQs) focuses on “Common Mode Configuration and Rejection Ratio”. 1. When does the op-amp said to operate in common-mode configuration? Explanation: When the same input voltage is applied to both input terminal of an op-amp, the op-amp is said to be operating in an common mode configuration. Explanation: The amplitude of common mode output voltage is very small and often insignificant compared to common-mode input voltage. 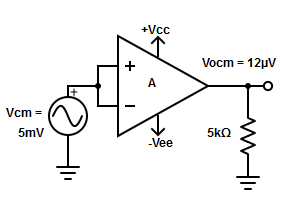 Therefore, the common mode voltage gain is generally much smaller than 1. Explanation: The mentioned circuit has the applied voltage common to both the inputs. Explanation: The common mode voltage gain is given as ACM = VOCM/VCM = 12µv/5kΩ =2.4*10-3. 5. 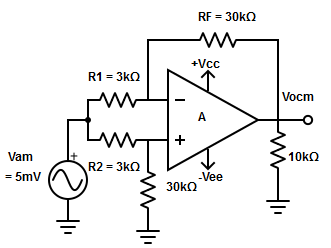 Define the common-mode rejection ratio (CMRR) of op-amp? Explanation: CMRR is defined as the ratio of the differential gain to the common mode gain, that is CMRR=AD/ACM. Explanation: AD= RF/ R1 = 30kΩ/3kΩ = 10. => Common mode output voltage, VOCM= ( AD* VCM)/CMRR = (10*5mV)/1778.28= 281.17mV. Explanation: Generally, the CMRR value is very large and usually specified in decibels (db). Also, the CMRR value can establish relationship with common mode output voltage. 8. When an op-amp exhibits poor common mode rejection? Explanation: A large common mode output voltage for a given common mode input voltage indicates a large degree of imbalance between the two input terminals or poor CMRR. Explanation: CMRR =(AD* VCM)/ VOCM, this equation indicates that the higher the value of CMRR, the smaller will be the amplitude of the output common-mode voltage.